Increase traffic to your listing with Auctiva's FREE Scrolling Gallery. Please scroll down the page to see additional photographs of this item. 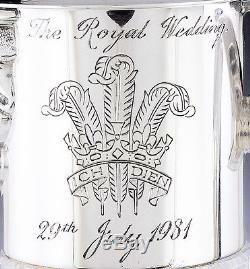 English Sterling Silver & Cut Glass Commemorative Royal Wedding Decanter. 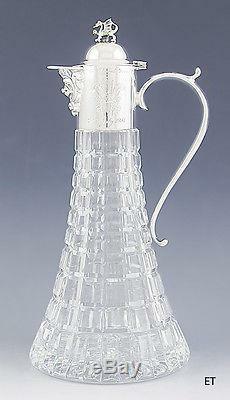 Presented is a fabulous English sterling silver and cut glass decanter, commemorating Prince Charles' wedding to Diana. 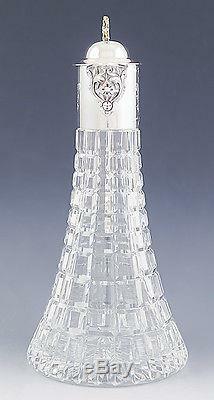 The decanter is dated 1981, with the silver made by Garrard & Co and the glass by Royal Brierley. The silver has a crest of three Prince of Wales plumes with a banner bearing Charles and Diana's initials. Above the crest is'The Royal Wedding' and beneath is the date, 29th July 1981. The crest is repeated on the other side. 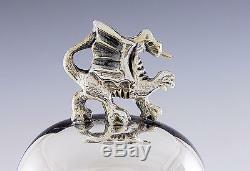 The lid has a wonderful Welsh dragon form finial. 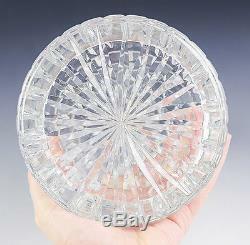 The glass is beautifully cut with faceted square designs and a rayed starburst on the underside. The decanter is hallmarked on the collar with the lion passant for sterling silver, the Tudor rose for the city of Sheffield, the date letter g for 1981, and the maker's mark for Garrard & Co Ltd. The lid is also hallmarked with the lion passant. The glass is signed on the underside for Royal Brierley. This piece is in excellent condition. The silver has no dents, no splits, no monogram removals, and no repairs. The glass has no chips, no cracks, no discoloration, and no repairs. 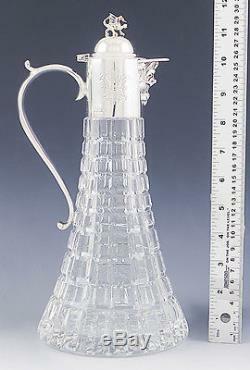 The decanter stands about 11 3/4 inches tall. Visit our sister store: grandmasattic3. Powered by SixBit's eCommerce Solution. The item "English Sterling Silver & Cut Glass Commemorative Royal Wedding Decanter" is in sale since Monday, December 14, 2015. This item is in the category "Collectibles\Barware\Decanters\1970-Now". The seller is "bubbleking" and is located in Essex, Massachusetts.